Directions: From the corner of Riverside Drive and Riverside Place in Covington, KY, turn to the east and park by the river. The John A. Roebling Suspension Bridge spans the Ohio River and connects Cincinnati, Ohio, with Covington, Kentucky. I took this photo of the bridge and downtown Cincinnati from the Kentucky side of the bridge, but Cincinnati is also brimming with photographic opportunities such as the Cincinnatian Hotel and the famed Cincinnati Music Hall. 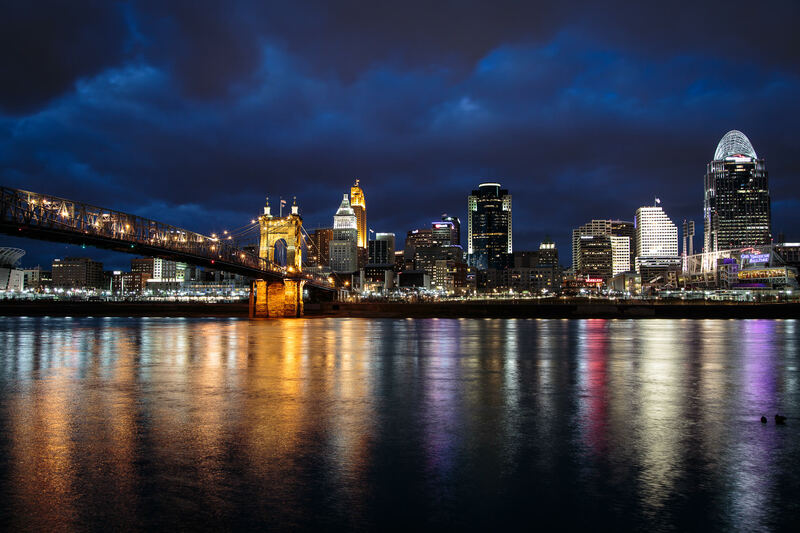 The best time to photograph the bridge and downtown Cincinnati is during blue hour, which starts about 15 minutes after sunset and 55 minutes before sunrise. Use a tripod so you can keep your ISO low. You will need a wide angle lens to get the bridge and downtown Cincinnati in the frame.